This month I have to report there is still much going on even though it appears not much is happening. Happisburgh is appalled, angry and still smarting from the complete blank its representatives drew from the ministerial meeting in May. Literally hundreds of letters have gone to Tony Blair. It appears however he is far too busy dealing with the rest of the world to read any of them, so his aides are replying with the news that they have forwarded them to the appropriate department: DEFRA. This is most unsatisfactory and most certainly not in keeping with the spirit of our democracy. So come on Tony get your backside into gear and have a good look at what Happisburgh and thousands of other good honest citizens around our shores are being forced to endure! Coastal Concern Action Group (CCAG) and North Norfolk District Council (NNDC) have worked both individually and jointly over the past four years to obtain effective sea defences. We have both put much time and effort into understanding each other’s position, the result is, I believe, a far greater appreciation by NNDC of the legitimate concerns and desires of the residents and on our part a far greater understanding of precisely what NNDC can, or more appropriately, can not do in terms of capital schemes. We have both presented the case of Happisburgh to the minister. We have both been told the same thing : Currently Happisburgh does not qualify under present criteria. That brings me on to the Coast Protection Act 1949 which is the statutory instrument governing coast protection. As I see it the so called criteria implemented by DEFRA, which we are all supposed to believe is written in tablets of stone and can not be got round, is not part of the 1949 Act. Therefore the criteria is not legally binding and can be changed, altered scrapped or implemented at will. 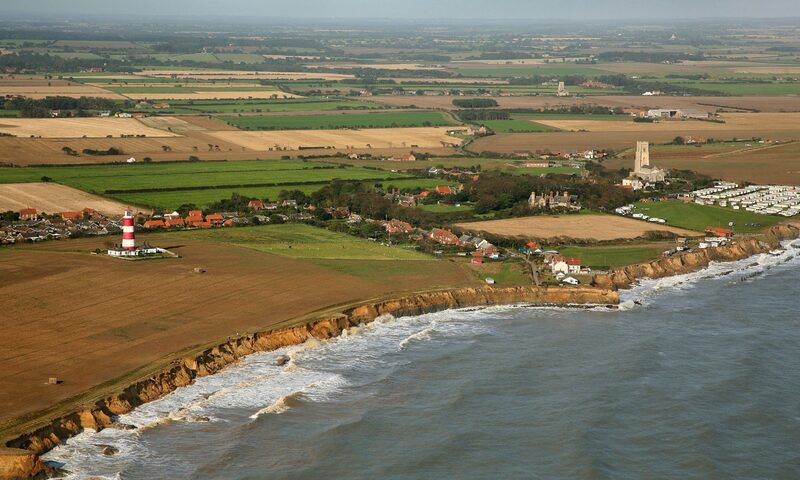 No local authority can be expected to finance capital schemes of the magnitude of what is required at Happisburgh. Quite rightly and properly it is a matter for Central Government to defend our shores. We are not asking them to create defences for what was hitherto undefended. Central Government installed effective defences in the late 1950’s, early 1960’s thereby creating the confidence for this community to flourish and grow. People who purchased property 20 years ago were told they had no reason to worry for 70 years. Those who purchased property 12 years ago were told they were safe for 60 years. ** All of them now just a few metres from the cliff edge. So it seems expert opinion and forecasts of erosion are quite worthless and not to be trusted. I have no doubt that NNDC officials are confounded as to where they go from here, they know what is required but have no support from their adversarial partner in these matters (HM Government) so I believe the officers will probably have to seek policy direction from the elected members. There are a number of alternatives but, I believe, only two options. One is to raise more money for coast protection. That could be done by levying a ring fenced annual charge of say ten pounds per household this would amount to just a few pence per week for each household and could be spent, as now, on all the coastline for which they are responsible. The other option I believe must be carried out, it is imperative that NNDC puts forward to DEFRA a request for capital grant aid for Happisburgh and promote a coast defence scheme. That is what the law of the land permits them to do and that is what the vast majority of residents require them to do. This I feel must be done irrespective of the criteria or the threshold score of 22 points both of which are not enshrined in the Coast Protection Act 1949 but are the latest whim of Government. There is one inescapable fact here: HM Government has a bounden duty to protect it’s citizens. I feel sure the elected members of NNDC will assist the Government to fulfil it’s duty and instruct their officers to put forward a capital scheme for Happisburgh. Finally a message to our illustrious Mr. Blair. Come on Tony at least read the letters being sent to you and get some idea of what is going on here. We can not blame you or you administration for the inaction of previous administrations however your administration is now totally aware of the situation here in Happisburgh. From this point forward your Government will hold full responsibility for whatever happens here in terms of coastal defence. GOOD OR BAD. ** Post Script – since publishing the above comments, the coordinator has had sight of documentation re: searches carried out on a property some 2 years ago and would like to emphasise that any suggestion that the property would not be subject to coastal erosion for 50 years was not obtained from NNDC.